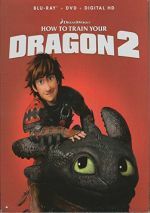 While 2010’s How to Train Your Dragon didn’t become a smash hit, it did well enough to spawn a sequel. We got that continuation via 2014’s How to Train Your Dragon 2. Five years after Hiccup (voiced by Jay Baruchel) bonded with dragon Toothless and taught his village to value those flying beasts, our lead discovers a hidden ice cave. In this location, he finds many heretofore unknown species of dragons and a mysterious “dragon-rider” named Valka (Cate Blanchett). 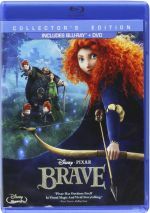 Before long, Hiccup learns a secret about Valka’s past, and he also confronts a new menace. 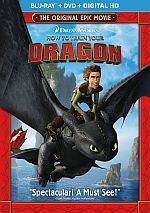 A tyrant named Drago (Djimon Hounsou) seeks to start a new war with the dragons, a quest that Hiccup attempts to thwart. Though I always thought the first Train offered reasonable entertainment, I felt it lacked the extra spark to make it special. It brought us a fairly likable adventure but unlike the same year’s Toy Story 3, it didn’t resonate and leave an emotional impact. Compared to Train 2, though, the first film looks like a classic. A fairly tepid semi-rehash of its predecessor, the sequel lacks much inventiveness, imagination or investment. If you look back at my review of the original Train, you’ll see I wrote it not long before the sequel hit screens. I indicated that I’d go to see Train 2 theatrically but my lukewarm attitude toward Train left me unenthused. I did see Train 2 on a big screen, but the movie did so little for me that I essentially forgot about it immediately. As I watched it a second time in late 2017 – three and a half years after my initial screening – I realized I remembered next to nothing about it. For good reason: Train 2 offers a wholly mediocre snoozer. Virtually nothing about the movie stands out, so it fades from memory as soon as it ends. Actually, I think Train 2 started to leave my mind as I watched it. The movie seems so bland and tepid that I could barely muster interest as it plodded toward its inevitable conclusion. Not that everything about the film flops. The addition of Blanchett adds some class to the proceedings, and the animation consistently looks great. Otherwise, though, I can’t find much to praise. The various action sequences lack much sizzle or excitement, and as alluded, the story often feels like a vague reworking of the first movie’s plot. The addition of Hiccup’s mother comes across less as an organic story point and more as a gimmick. It feels like the screenwriters had already become so bereft of inspiration that they needed to reach for an improbable twist like the mother’s return after many decades. This could’ve inspired a bit of drama and emotion, but Train 2 can’t even milk those easy points. Hiccup and his dad (Gerard Butler) accept Valka’s return with nary a blink – it’s bizarre how easily they swallow her explanation and go back to business as semi-usual. Apparently Train 3 will come out in spring 2019, and maybe it’ll find some form of inspiration and creativity. It can’t be less interesting than the wooden, dull Train 2. How to Train Your Dragon 2 appears in an aspect ratio of approximately 2.35:1 on this Blu-ray Disc. From start to finish, the flick looked great. Sharpness seemed immaculate. Not a single slightly soft shot emerged in this tight, precise image. No issues with jagged edges or moiré effects materialized, and I witnessed no edge haloes or artifacts. Print flaws also failed to appear. Given the movie’s frozen environments, blues dominated its palette. These didn’t overwhelm, though, and various elements like the dragons allowed for some hues to pop. These colors came across well. Blacks came across as dark and dense, while shadows appeared smooth and clear. I felt totally satisfied with this terrific presentation. Almost as good, the film’s DTS-HD MA 7.1 soundtrack also worked very well. With all the movie’s action, the mix gave us many active moments and lots of impressive sequences. Flying elements zoomed around the room, and other components – like battle material – made strong use of the various channels. These all combined to form a well-integrated soundscape. Audio quality was top-notch. Speech appeared distinctive and concise, without edginess or other issues. Music seemed robust and rich, while effects gave us clean, accurate information; bass response also appeared deep and taut. Everything here worked well to create an “A-“ soundtrack. As we shift to extras, we start with an audio commentary from head of character animation Simon Otto, producer Bonnie Arnold, director Dean DeBlois, and production designer Pierre-Olivier Vincent. All of them sit together for a running, screen-specific look at story/characters, animation and visual design, music, cast and performances, and connected domains. Expect a fairly good chat here. While nothing about the commentary soars, it manages to offer a reasonably broad view of the production, so it turns into a worthwhile listen. A new short called Dawn of the Dragon Racers goes for 26 minutes, 37 seconds and provides another adventure with Hiccup and pals. It mixes movie actors like Jay Baruchel and America Ferrera with the cast from the Dragons TV show. “Racers” delivers decent entertainment value. With Fishlegs’ Dragon Stats, we find an interactive piece that collects a mix of short clips. In these, “Fishlegs” tells us facts about dragons. It seems like a fun little bonus – and the presence of a “Play All” option makes it more user-friendly. Something similar arrives via Drago’s War Machines. Complete with narration by “Fishlegs”, we get info about various weapons seen in the movie. Like “Stats”, “Machines” offers a nice collection of details. Next comes a featurette called Berk’s Dragon World. It fills four minutes, 19 seconds and presents Hiccup’s tour of Berk to show how the realm changed since the first film. Though nothing special, it becomes a good little overview. In the same vein as “Stats” and “Machines”, Hiccup’s Inventions in Flight provides another interactive gallery of clips that examine the character’s innovations. It also brings us a fine look at the details. A documentary called Where No One Goes: The Making of How to Train Your Dragon 2 runs 54 minutes, 40 seconds. The program includes notes from DeBlois, Arnold, Vincent, Otto, supervising sound designer Randy Thom, head of story Tom Owens, author Cressida Cowell, visual effects supervisor Dave Walvoord, and actors America Ferrera, Gerard Butler, Jay Baruchel, TJ Miller and Cate Blanchett. “Goes” starts with the film’s announcement, the composition of the script and a research trip. From there we learn about visual design, aspects of the creation/execution of the dragons, set design, characters, cast and performances, animation, and music. Though a little scattershot at times, “Goes” puts out a fair amount of useful material, so it turns into a winning show much of the time. Including introductions from DeBlois, four Deleted Scenes fill a total of 12 minutes. These expand some character areas and add a little intrigue, though none of them stand out as crucial. A Gallery offers 34 stills. These display concept art and give us a nice collection of images. The disc opens with ads for Penguins of Madagascar, Mr. Peabody and Sherman, and Book of Life. 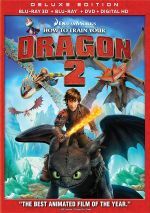 We also get trailers for Train 2, Turbo, The Croods, Jingle All the Way 2, DreamWorks’ Dragons, and the Rise of Berk game. Finally, World of DreamWorks Animation adds more promo material. A second disc provides a DVD copy of Train 2. It includes “Dragon Stats”, the gallery, the trailer/promos but lacks the other Blu-ray extras. Though I didn’t love the first film, it looks like a classic compared to the bland How to Train Your Dragon 2. Little more than a by-the-numbers reworking of the original’s themes, the sequel lacks charm or excitement. The Blu-ray boasts excellent picture and audio along with a pretty good set of supplements. Train 2 doesn’t even live up to my modest expectations.